At least 29 children and newborn babies have died in freezing temperatures after fleeing conflict in the last Isis controlled villages in eastern Syria. Those arriving are mainly women and children fleeing rural areas of neighbouring Deir ez-Zor. Kurdish and local Arab tribes, backed by a US-led coalition, are fighting to clear Isis near the town of Hajin in the Euphrates river valley. Humanitarian access to the camp in al-Hasakah governorate, and to surrounding roads, has been hampered by bureaucratic obstacles and security constraints. Many families were delayed for hours in the open countryside after they were forced to undergo security checks by Syrian Democratic Forces. “At least 29 children and newborns are reported to have died over the past eight weeks, mainly from hypothermia, while travelling to the camp or shortly after arrival,” the WHO said in a statement. 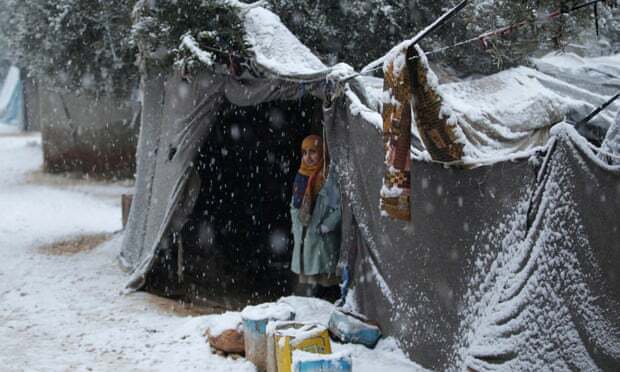 On Wednesday, the UN under-secretary general for humanitarian affairs, Mark Lowcock, warned that millions of people living in tents or without heating heating face freezing conditions, snowfall and heavy rain. Conditions facing families who abandoned Deir ez-Zor were a grave concern, he said. “[People fleeing] have been exposed to hostilities, explosive hazards, intense cold and prolonged security screenings, through which they have received minimal assistance,” said Lowcock. The WHO said the situation at al-Hol camp was critical and called on all parties to the conflict to provide unhindered humanitarian access to people in need of life-saving aid. Elizabeth Hoff, the WHO Representative in Syria, described the situation in al-Hol camp as heartbreaking. “We are scaling up our efforts in al-Hol, but we need faster approvals to allow us deliver supplies, and we need guaranteed access to both the camp and the roads leading to it,” she said.